Here is my fourth checklist with cards from 76-100. Seems like a nice even number to end the year on. My first checklist used the 1961 Topps format. I chose that because it was the first year Topps produced checklists as part of the set instead of unnumbered inserts or on the back of team cards. I followed with 1962 and 1963 Topps checklists. 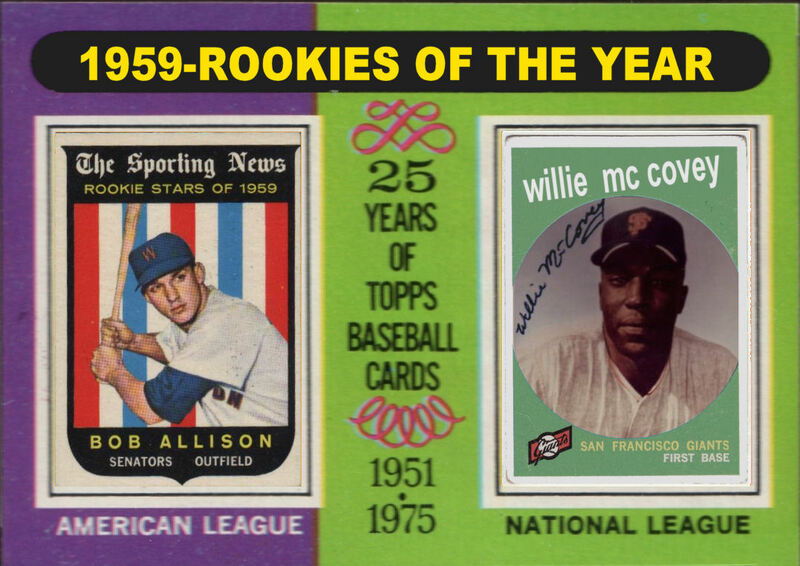 For the 4th series I decide to use the 1963 Fleer checklist instead of going straight to 1964. It's a nice looking card from a good looking set, just too hard to pass up. I started this blog in June. Since then there have been 100 cards plus 4 checklists. 2012 looks to be a good year for baseball cards. The Topps base set looks nice and the Heritage set is base on the 1963 set which I always liked. Plus Topps is putting out another Archives set. Joe DiMaggio was a Bay Area native and began his professional baseball career at the age of 17 playing for the San Francisco Seals. He also ended his baseball career in the Bay Area. 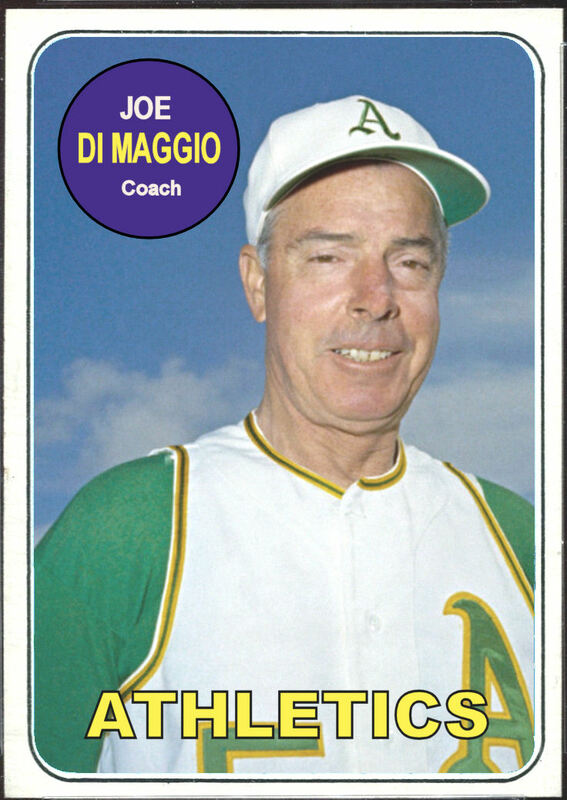 When the Kansas City Athletics moved to Oakland, the "Yankee Clipper" was their batting coach in 1968 and 1969. 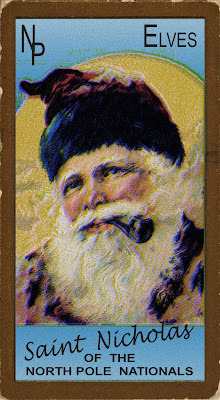 I was looking to do a few "Christmas Cards" and wanted to see what else was out there before I started. 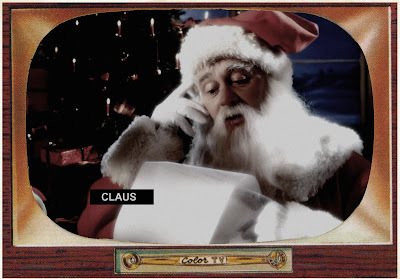 That's when I came across the 2007 Topps Christmas Set. See images below. I had no idea these existed. I may have to pick up a set on eBay. I came across this picture of Nellie Fox as coach for the Senators standing next to Frank Howard and thought it needed to be shared. Baseball-Reference has Nellie listed as 5'10" 160lbs (a bit generous) and Hondo at 6'7" 255lbs. 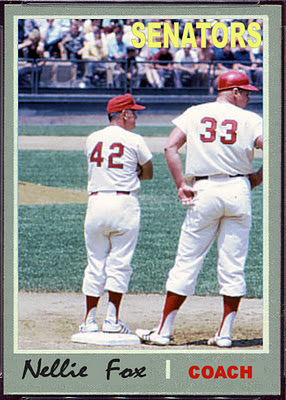 Even with Fox standing on first base, Howard dwarfs him. Nellie Fox's last Topps card showed him as "2nd Base-Coach" for the Astros in 1965. Although he played his last game in 1965 he continued as coach for the Astros through the 1967 season. He coached the Senators from 1968-1971 and moved with the franchise to Texas for the 1972 season. At the end of the 1964 season the Braves sold the 44 year old Spahn's contract to the New York Mets. Span pitched and acted as coach for the Mets until he was released on July 17th. 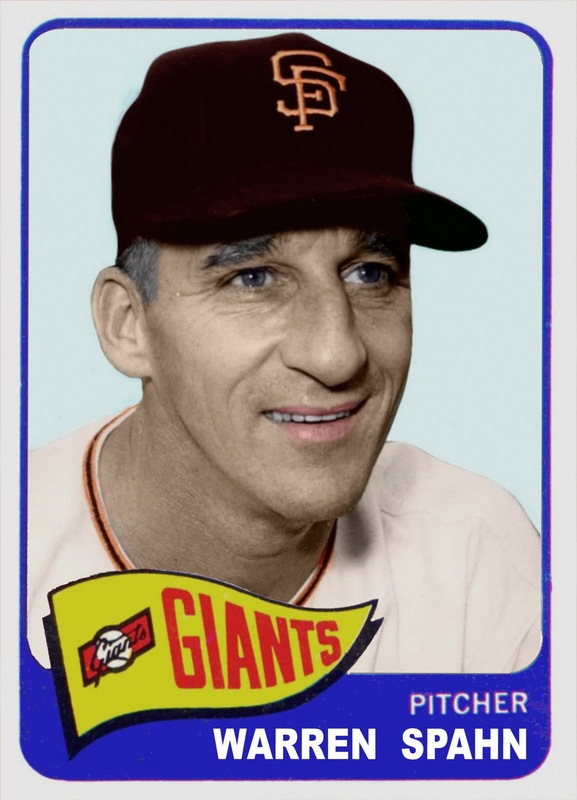 Two days later the Giants signed Spahn who went 3-4 for the remainder of the season. After retiring from the mound, Spahn coached in the Cardinals, Indians and Angels organizations. He also coached in Japan and the Mexican Baseball League. 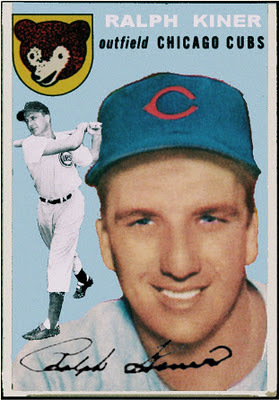 The 1954 Topps set did not include Hall of Famer Ralph Kiner. That's not surprising given the issue with players signing contracts at the time exclusively with either Topps or Bowman. What is disappointing is that his card also wasn't included in the 1994 Archives set. 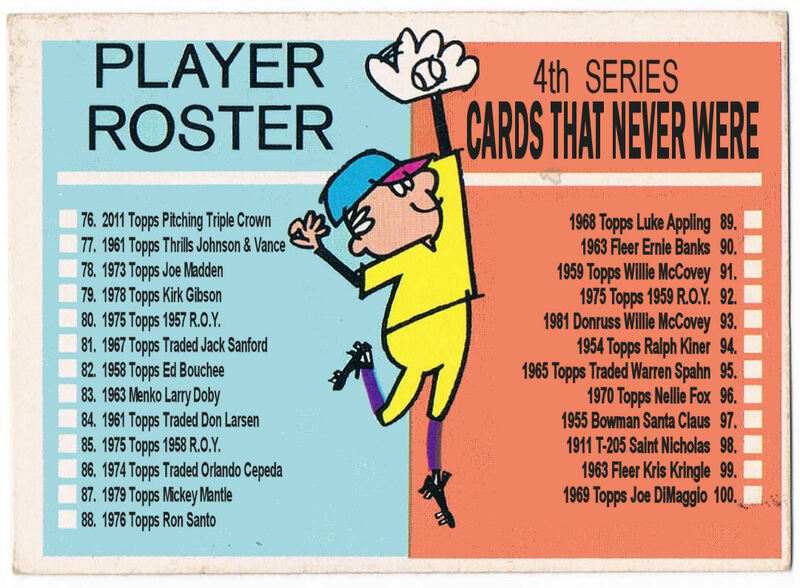 Topps expanded the 1953 set in its 1991 Archives by 57 cards but the 1994 Archives set was only expanded by 8 "Rookie Prospects". I think they missed an opportunity to include several great players like Kiner. Even though his last game was in June of 1980, Fleer included a card of Willie McCovey in its 1981 set. 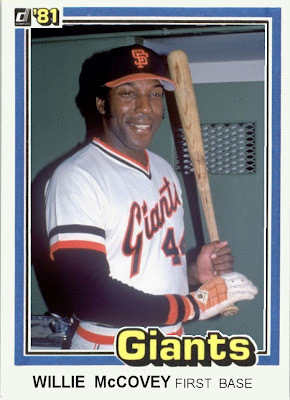 Topps didn't make a 1981 McCovey Card but if you would like to see what it might have looked like check out Uncle Doc's Closet. With those two cards out there, I felt that Donruss needed some representation. 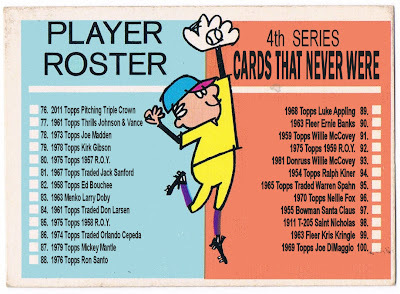 Here is the 1959 edition of my recurring theme putting the ROY's on the 1975 Topps MVP cards. In 1959 Topps made the first of its Rookie Stars cards which featured mostly forgettable players and the American League Rookie of the Year, Bob Allison. 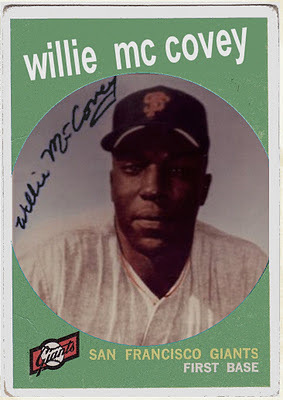 I considered making Willie McCovey's card similar to Allison's but made a regular issue card because I thought it would look better on this card. It gives the 1975 card a better representation of the 1959 set. Allison played for the Senators until they moved to Minnesota in 1961. He continued to play for the Twins until he retired at the end of the 1970 season. 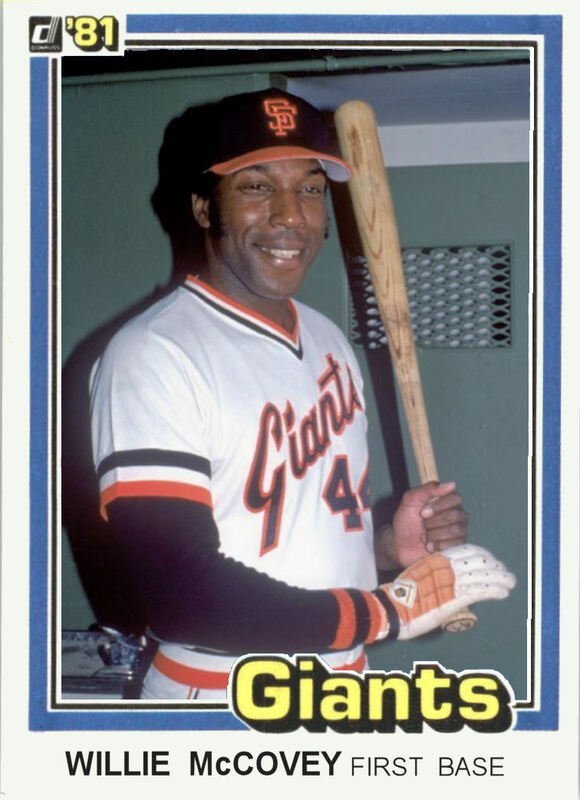 McCovey Played for the Giants until 1973 when he was traded to the Padres. He was purchased by the A's at the end of the 1976 season. He returned to San Francisco in 1977 where he retired in 1980. Willie McCovey's 1959 season started with him hitting 29 homers for the Giants' AAA team in Phoenix. In late July he was brought up to the Giants where he hit .354 with 13 homers in just 52 games. He was the unanimous winner of the N.L. Rookie of the Year. The Giants already had 1958 Rookie of the Year, Orlando Cepeda, at first base but had to make room for McCovey so they sent Cepeda to the outfield. Over the next several seasons both natural firstbasemen would have all-star seasons in the outfield as well as at first for the Giants. With only 66 cards issued before Topps slammed the door shut, the 1963 Fleer set has a lot of potential for "Cards That Never Were". Here is one of my all time favorite players who didn't make the first series. Ernie Banks was one of several Hall of Famers not in this set. 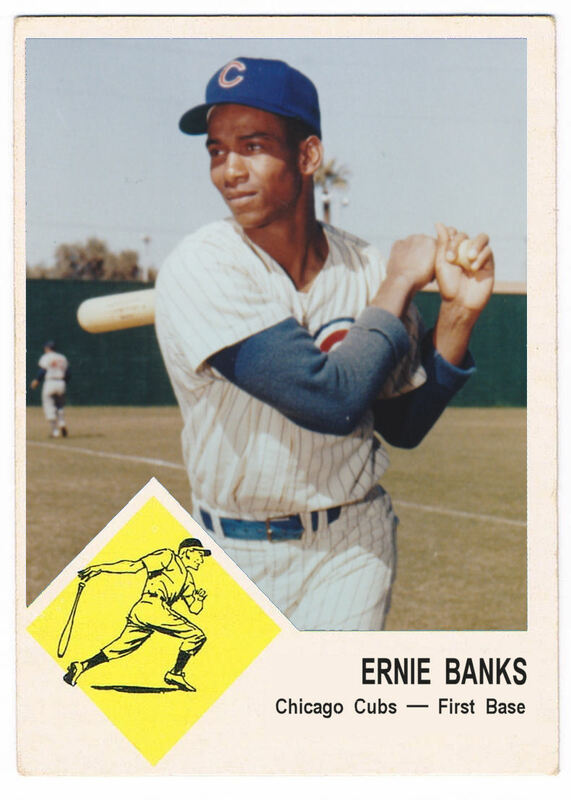 In 1998 and 2003 Fleer created cards of several missing players for their "Tradition" Sets, but an Ernie Banks card was not one of them. After his Hall of Fame playing career ended, Luke Appling coached in minor and major league organizations of the White Sox, Orioles, Tigers, Indians, Braves and Athletics. 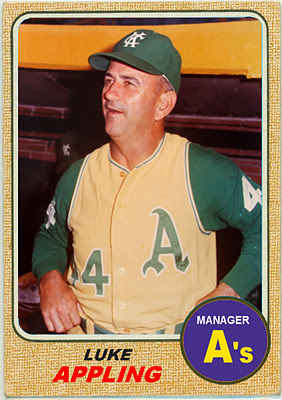 His only chance as a big league manager came in late 1967 after the A's parted ways with Alvin Dark. Appling managed the team to just 10 wins in their last 40 games. By the start of 1968 the A's were in Oakland and Bob Kennedy was their new manager. Today Ron Santo has finally been elected to the Hall of Fame. He received 15 of 16 votes by the veteran's committee. This is a repost of a card I made for my other blog Six Degrees of Ron Santo. Here is the final Mantle card of the '70s. 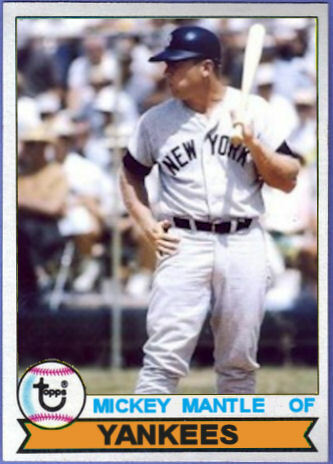 Mantle's final game was in 1968 and his final regular issue Topps card was in 1969. 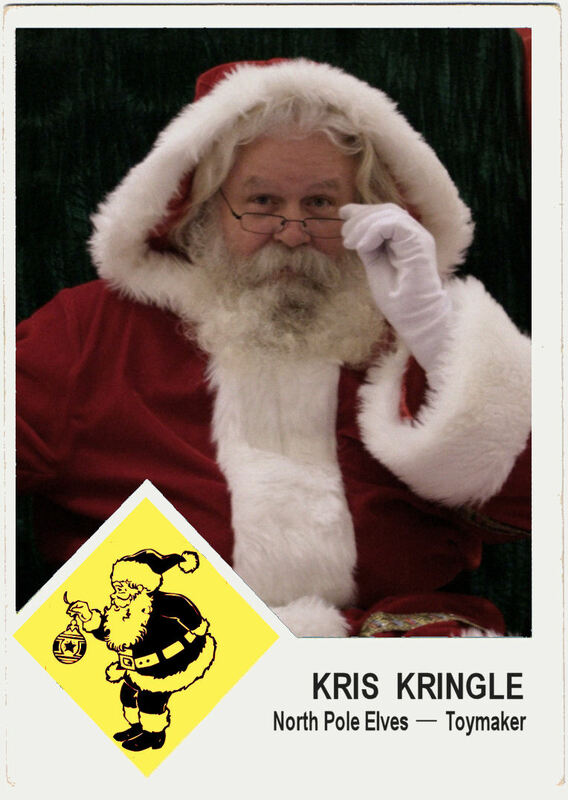 But in 2006 Topps issued a Wal-Mart exclusive insert in the 1970 format and earlier this year a 1975-mini version was included in the 2011 Lineage set. The other 8 can all be found on this blog. The former Rookie of the Year injured his knee in 1971 with the Braves and his numbers began to decline. 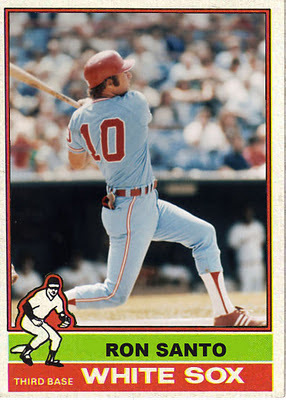 He was traded to the A's in 1972 where he played in 3 game without a hit then underwent another surgery to his knee. When the MLB created the designated hitter, Cepeda was signed by the Red Sox as the first player contracted to DH exclusively. 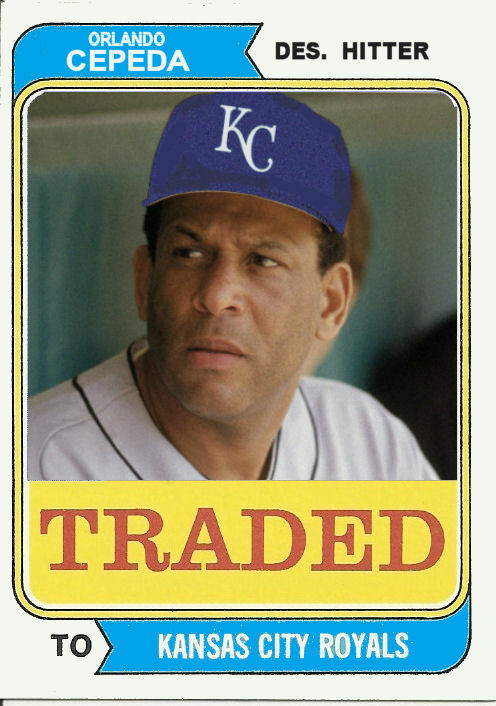 He played one more year in Kansas City playing part time and retired at the end of the season.